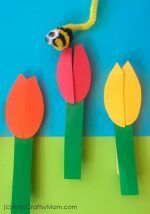 Make a beautiful Craft Stick Dragonfly Craft for a spring or summer! 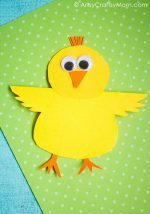 This is a fun craft project for kids to make. There is something very delicate and innocent about a dragonfly, isn’t there? They are pretty hard to catch, but thanks to our Craft Stick Dragonfly Craft, you can hold one in your hands today! 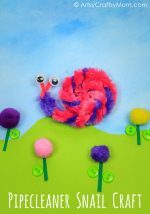 This is a super, super easy craft that’ll take all of five minutes! With very basic supplies, you and the kids can make it in a jiffy – seriously, in a jiffy! And no problem if you don’t have colored craft sticks, just paint plain ones and you’re good to go! And no problem if you don’t have colored craft sticks, just paint plain ones and you’re good to go! 1. Let’s start by getting the wings ready. Pick up pipe cleaners in colors of your choice and fold them into wings. 2. Make another set and join them together by twisting the ends to secure them in place. 3. Stick the wings on the back of your craft stick. Use enough glue to secure the wings but not so much that they slide right off! 4. Stick on a pair of googly eyes – use small ones, large ones or the pretty ones with lashes for a girl dragonfly! Then go about decorating your dragonfly with Sharpies. 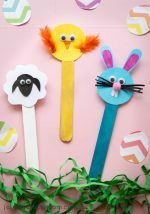 That’s it – your super-easy Craft Stick Dragonfly Craft is ready!! This is so easy that you’ll be tempted to make another – and another! Well, no one’s counting, so make your own batch of multicolored dragonflies. Here’s a great idea – make a set and attach little magnets to the back and stick them up on a magnetic surface. 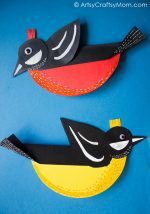 Or put self-adhesive tape on the backs and decorate a little garden scene on one part of the kids’ room – there are so many ways to use these delightful creatures!